Bromelain (a purified protease of pineapple) (Baur and Fruhmann, 1979) . EAST, CAP (Reindl et al. 2002). 19 (Reindl et al. 2002). 10/19 sera reacted with pineapple in the CAP assay and six had a positive result in the pineapple profilin EAST (Reindl et al. 2002). IgE binding to the recombinant profilins was observed in 8/19 sera from subjects with suspected pineapple allergy (42%). 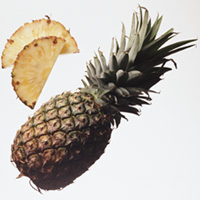 In the pineapple extract immunoblot 13 sera reacted with proteins ranging from 20 to 50 kda. At least 2 sera reacted only to pineapple profilin (Reindl et al. 2002). High IgE cross-reactivity between pineapple profilin, birch pollen profilin Bet v 2 and latex profilin Hev b 8 was demonstrated by immunoblot inhibition as well as EAST inhibition experiments. In addition, cross-reactivitiy between pineapple profilin and banana profilin has been demonstrated (Reindl et al. 2002). IgE reactivity to profilin in pollen-sensitized subjects with adverse reactions to banana and pineapple. Pineapple profilin is thought to be an actin-binding protein of the cytoskeleton (Carlsson et al. 1977).